There is a common belief that if a native Texan leaves their home state, they are cursed with mediocre to bad Tex-Mex food for the rest of their lives. I left Texas in 1997 and have created a successful workaround solution. I have been disappointed too many times to believe the critics and peers who say that this or that place has good Mexican. Good Tex-Mex food outside of Texas is rare. It’s not high brow. In fact, many respectable Tex-Mex restaurants have cement floors and smell like a combination of bleach, spilt beer, lime, tomatoes and burnt corn chips. Since leaving home, I have learned to improvise and make my own Tex-Mex combining local, seasonal ingredients with a few shortcuts. For years I have cooked enchiladas this way. Instead of truly separate enchiladas, this recipe turns out like a casserole, but it’s still damn good. 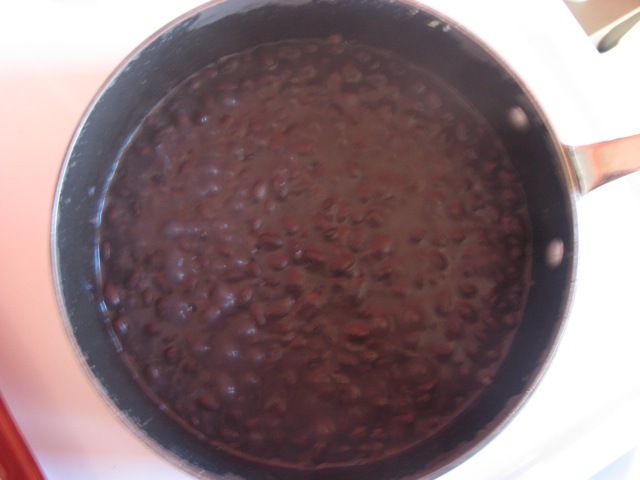 The frijoles negroes, or refried black beans, are dirt simple to make. I learned to make excellent refried beans from watching Rick Bayless and also from my college friend Faera Taylor (Siegel) who once lived in Mexico. This dinner is a typical weeknight meal at our house. It weakens the curse a bit. Preheat oven to 375F. 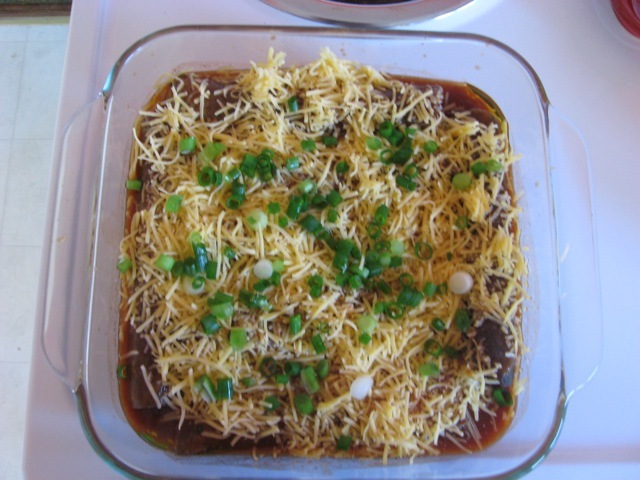 In a baking dish (at least 9×12), coat dish with 1 tablespoon olive oil and about 2 tablespoons of the enchilada sauce and set aside. In a wide saute pan, add 1-2 teaspoons oil, chopped spinach, pinch salt, oregano and cook until wilted. Remove from pan and set aside. Wipe out frying pan with a towel and add 1 teaspoon olive oil for every two-three tortillas cook each of the tortillas until warmed. Set aside. Create an assembly station with spinach, tortillas, and shredded cheese. 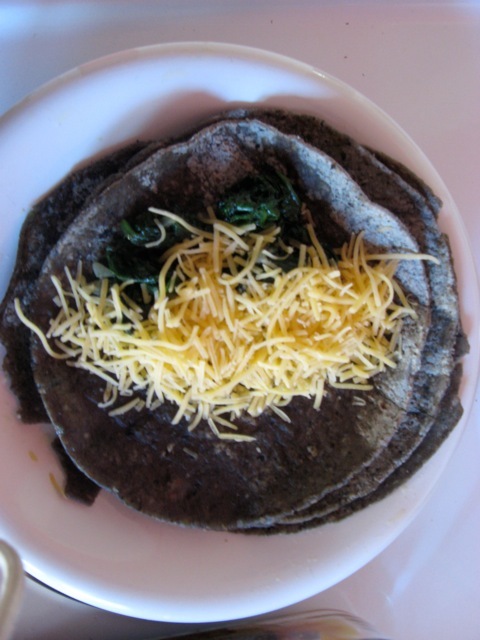 Roll each tortilla with a spoon full of spinach and 1 tablespoon of cheese and place inside the coated baking dish. Repeat with remaining tortillas and mixture. Pour remaining enchilada sauce over the filled tortilla rolls and top with more shredded cheese and chopped scallions. Bake for 25-35 minutes until cheese is slightly browned. Remove from oven and let cool for about 5 minutes. Slight cooling will make serving portions easier. Assemble vegetables, tomato and avocado. Drizzle oil, salsa and vinegar over the top and serve cold. In a saute pan over medium heat, cook oil and minced garlic until almost browned. Add whole contents of can of beans and warm through. Add salt, epazote and then mash with a potato masher until creamed. Cook a minute more and serve. I normally use regular yellow or white corn tortillas, but this is what I had on hand. 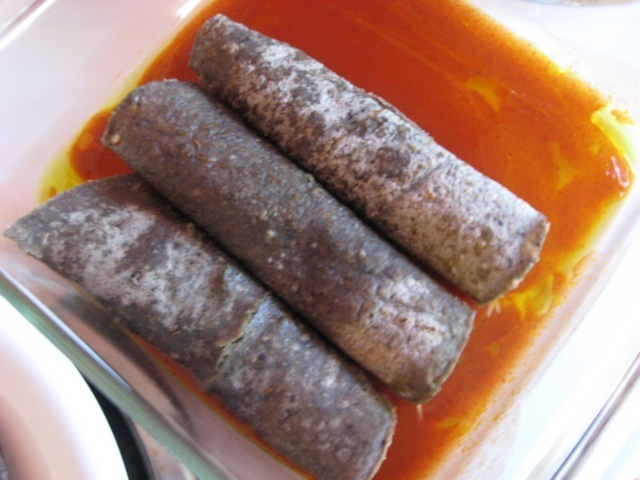 I had blue corn enchiladas at Chuy’s and Blue Mesa Grill- but then again- Blue Mesa is not Tex-Mex is it? All I’m saying is that my enchiladas are really better than anything else around here-I’ve given up with so called Mexican restaurants around here. Suppose it’s possible but I’m really skeptical. Regarding Tex-Mex- it’s been a trail of disappointment from NY to the Pacific Northwest. I make my own now. Had the same problem when we left Austin and moved to the Caribbean. 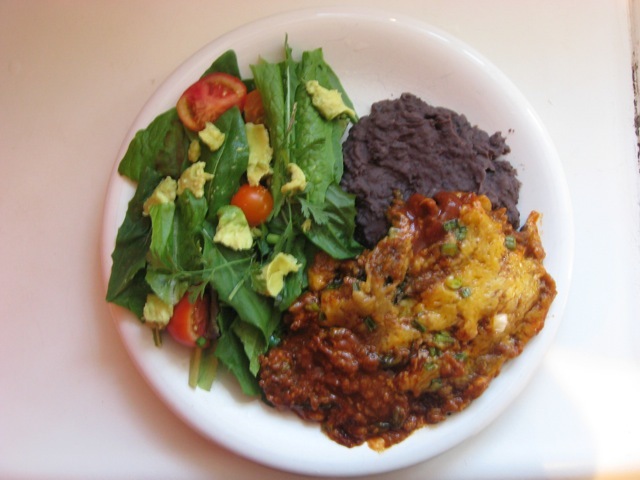 I kept looking online and found a great site for real Tex-Mex recipes. The best enchilada gravy (Ancho chili sauce) I’ve ever tasted came from http://www.texmex.net. Ask your mama what she thinks about it. I got the impression she would have stood over the pot and eaten it with a spoon it was so good. Don’t know if the site is still available but it was a Godsend for me when we were on St. John. BTW, don’t even think of trying to get real Tex-Mex in Hampton Roads, VA unless you can get to Abuelo’s. Otherwise you will be sooooooo disappointed. It looks like you truly have a talent for Tex-Mex. Since you learned to make refried beans by watching Rick Bayless, you might be interested in hearing about Rick’s latest book and adventure’s in cooking Mexican cuisine for the Presidnet of Mexico and President Obama at the White House. He’ll be talking about it with Charlie Rose on Bloomberg Television tonight. There’s a clip of the episode, including the Bayless segment, on Facebook: http://www.Facebook.com/BloombergTelevision. The rest of it is beyond nasty!